Our popular book The Book Changer addressed GBC guru HH Jayadvaita Swami making a "really large-scale revision" to Srila Prabhupada's Bhagavad-gita As It Is. Recently, Jayadvaita Swami launched an attack on the IRM's position of defending Srila Prabhupada remaining ISKCON's diksa guru. The quotes in boxes are from a talk given by Jayadvaita Swami on 5/11/18. "I wrote a series of essays which were published as "Where the Rtvik People Are Wrong", "Where the Rtvik People Are Wrong Again", [...] these deal with the rtvik notions as originally put forward in that infallible sastric work, The Final Order by – what was his – Krishnakant, uh, acarya. So, they've, their ideas are rubbish." Jayadvaita Swami's paper "Where the Rtvik People Are Wrong" was written in early 1996, and we rebutted it in April 1996. This rebuttal can be read here. His follow-up paper "Where the Rtvik People Are Wrong Again" was also rebutted by us, and this rebuttal remains unanswered to this day. This rebuttal can be read here. We may also note that since The Final Order ("TFO") was not even submitted to the GBC until many months after Jayadvaita Swami's paper "Where the Rtvik People Are Wrong" was written, Jayadvaita Swami's paper could not directly address what was put forward in TFO. And his follow-up paper "Where the Rtvik People Are Wrong Again" was only a reply to our rebuttal of his first paper "Where the Rtvik People Are Wrong", and thus also did not directly address what was put forward in TFO. Thus, anyone who reads our rebuttals to Jayadvaita Swami's papers and TFO will easily see that the only "rubbish idea" here is the idea that Jayadvaita Swami's papers actually "deal" with anything! "Nor have I seen any sastric evidence that we're supposed to jump over the, jump to departed acaryas, and in this way become connected with the sampradaya. [...] How do we deal with this rtvik idea, the idea that one, that everyone in the world can become Prabhupada's directly initiated disciple?" 1) Jayadvaita Swami has not presented any "sastric evidence" for his idea that as soon as Srila Prabhupada departed, he automatically ceased to be the current link in the parampara. Consequently, without such evidence, Srila Prabhupada's status as the current link remains, and thus there is no "jump" required to connect to him. Hence, Jayadvaita Swami is nonsensically demanding to see "sastric evidence" for a non-existent "jump" – but sastric evidence does not need to be shown for something that does not exist! 2) After ISKCON's founding in 1966, Srila Prabhupada established himself as the Acarya and sole diksa guru of ISKCON, so that from that moment onwards "everyone in the world" actually could become "Prabhupada's directly initiated disciple". 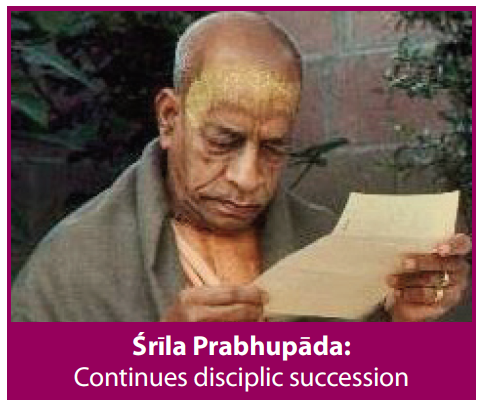 And this is what happened, with anyone joining ISKCON able to become Srila Prabhupada's directly initiated disciple. And this program was never terminated by Srila Prabhupada. Nor, as just noted, has Jayadvaita Swami presented any evidence to prove it should have terminated because Srila Prabhupada physically departed. On the contrary, the program was simply confirmed on July 9th, 1977, by a signed directive from Srila Prabhupada which enabled it to continue. "Their ideas are rubbish [...] which has no backing from sastra, from history, from Prabhupada [...] Prabhupada taught disciplic succession, not disciplic cessation." 1) As noted in the last section, it is a historical fact that Srila Prabhupada established himself as the Acarya and diksa guru of ISKCON. Thus, Srila Prabhupada being the diksa guru of ISKCON is the undisputed starting point, and hence requires no further "backing". Rather, the actual "rubbish idea" is the restriction that Srila Prabhupada must automatically cease to act as the current link diksa guru just because he physically departs. There is no backing from Srila Prabhupada for this restriction. 2) It is actually Jayadvaita Swami who is against the idea of disciplic succession, having continued to initiate alongside his disciple, Kadamba Kanana Swami, rather than let himself be succeeded, as documented in BTP 57, "Guru Hoax Self-Defeat Against the IRM". Whereas, as long as Srila Prabhupada remains the "current link", the disciplic succession is continuing with him as the 32nd link in the disciplic succession given at the beginning of Bhagavad-gita As It Is. And, as noted, there is no automatic restriction or time limit for how long Srila Prabhupada can continue the disciplic succession as its current link. "Srila Sanatana Goswami quotes that those who follow some path which is not authorised [...] it's simply a disturbance. I haven't seen any sastric evidence that one goes back to Godhead by going off course and creating a disturbance in the society of devotees." "Is this an outright fabrication or not? That Srila Prabhupada ‘personally detailed the procedure for increasing the number of initiating guru[s]' is something we can only wish. Or falsely tell the Society he did." "Our present system has institutionalized a process of senior devotees voting or offering no-objection to prospective gurus. But we do not find that this institutionalized blessing seeking process is mentioned by guru, sadhu or sastra as the way that one is authorized to become a guru." And Jayadvaita Swami accepts there is no sastric evidence that following such an unauthorised path will lead one back to Godhead – thus condemning himself and his GBC guru colleagues! a) Despite his boasts, Jayadvaita Swami has not actually answered the IRM's position. b) Jayadvaita Swami is actually the one who does not believe in disciplic succession. c) Jayadvaita Swami accepts he is following an unauthorised path that will not lead to him or his GBC guru colleagues going back to Godhead.